As first announced last week, Blizzard has officially unveiled the sixth expansion for World of Warcraft today during an event at Gamescom in Cologne, Germany. The expansion will be titled World of Warcraft: Legion. The expansion will build off of last year’s World of Warcraft: Warlords of Draenor. A CG video that game director Tom Chilton called a “connecting piece” to the next expansion showed off evil orc warlock Gul’dan discovering what appeared to be well-known World of Warcraft antagonist Illidan Stormrage. 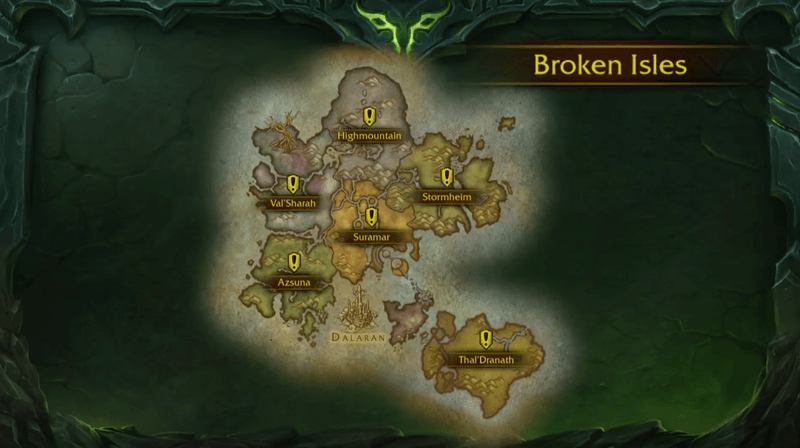 World of Warcraft: Legion will include a new continent called The Broken Isles. The level cap will be increased from level 100 to level 110. A reworked player-versus-player honor system will also be in effect. As players rank up through honor ranks, they’ll now unlock special talents designed solely for player-versus-player combat. The PvP ranking system will also include a Call of Duty-esque prestige option, allowing you to reset your rank when you hit the camp and start over from the beginning. Unique mounts and artifact looks will be unlocked via prestiging. New artifact weapons are being introduced which will allow players to customize legendary weapons. The two artifact weapons revealed so far include Ashbringer and Doomhammer, weapons with long histories in the Warcraft universe. However, Blizzard says there will be 36 artifacts in total, one for each class specialization. Artifact weapons will have their own talent trees for players to level up and improve as they play, but they’ll also include visual customization so players don’t feel like they’re all wielding the exact same weapon. Blizzard revealed that Legion will include players going to the Broken Isles, a new continent, and discovering the Tomb of Sargeras, a focal point for the invasion of the Burning Legion demon army. Players will be searching the new zones for the “Pillars of Creation,” relics leftover from the Titans who once ruled the world of Azeroth. Dalaran, a floating city that was previously the main hub for the World of Warcraft: Wrath of the Lich King expansion, will now be headed down to the Broken Isles to once more serve as a meeting place for players. The Night Elf-centered zone of Val’Sharah will include a trip to the Emerald Dream, another realm frequently rumored as the setting for a future World of Warcraft expansion. Blizzard also showed off a new hero class, the Demon Hunter, which seems to be based around Illidan. The developer says it will show us “the story of the Demon Hunters, the Illidari, through the eyes of Illidan.” When beginning a new Demon Hunter character, players will actually play through flashbacks going back to the World of Warcraft: Burning Crusade expansion. Demon Hunters will start at a high level. In addition to their regular abilities, they’ll have the ability to morph into a more powerful demonic figure, taking on the form of the enemies they’re hunting. Demon Hunters will only have two specializations rather than the normal three. The havoc spec will be damage-focused, and the vengeance spec will allow for tanking. For those not swapping to a Demon Hunter, players will encounter a new system called “Class Orders.” This will put each player’s character in charge of an organization based around whatever their class is. As an example, the shaman conclave will overlook the Maelstrom, the paladin templar sanctum will be beneath Light’s Hope Chapel, and the warlock enclave will exist on a Burning Legion portal world. Class orders will include a champion system that Blizzard said would build on the follower system from the Warlords of Draenor expansion. Champions will be non-player characters who you help out with. Blizzard promised they will be more active in the world in this expansion and with more interaction. Blizzard also said it had done a “disservice” to dungeons in World of Warcraft and promised more dungeons and more replayability in Legion compared to previous expansions. A number of these dungeons were discussing, including Eye of Azshara, Darkheart Thicket, Suramar City and the return of Violet Hold, a Dalaran-based dungeon previously seen in the Wrath of the Lich King expansion. The first raids announced for Legion include the Emerald Nightmare, a twisted version of the Emerald Dream where players will search for the legendary druid patron god Cenarius and fight the evil Xavius. A 10-boss raid called Suramar Palace will also be included, which will culminate in a fight against Gul’dan.